Crosshole Sonic Logging (CSL) of drilled shafts requires 1.5-in (38-mm) or 2-in (51-mm) I.D. sonic access tubes to be installed inside the steel reinforcement cage. 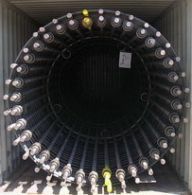 The sonic access tubes do not contribute to the structural capacity of the drilled shaft. The proposed use of Ischebeck TITAN T73/56 CSL/Hollow Threaded Rebar for Cross Hole Sonic Logging Access Tubes Combined with Longitudinal Concrete Reinforcing in Drilled Shafts (patent pending) is discussed as an alternative method of construction and CSL probe access. The T73/56 hollow threaded rebar/sonic access tube performs as a high strength rebar while at the same time creating a 2.2-in (56-mm) I.D. sonic access tube. The deformed high strength hollow bar provides better adhesion to concrete thus reducing the problem of debonding associated with smooth PVC and steel pipe. A cost comparison using conventional rebar with added sonic access tubes is discussed. The use of T73/56 CSL/Hollow Threaded Rebar as a value engineering alternative can reduce both material and labor costs for drilled shaft construction and can provide an advantage where anchor bolt cages and longitudinal reinforcing create congestion.